Summary: According to researchers, familial relationships in movies affect the reactions in the viewer’s brain to moral dilemma addressed between characters. Are we more prone to help the person that resembles us the most? Social neuroscientists have studied the effects of similarity by showing a re-edited version of the film My Sister’s Keeper to a group of subjects and by giving them a moral dilemma to consider while measuring their brain function by means of functional magnetic resonance imaging. The subjects comprised 30 women who were shown a version of the film shortened to 25 minutes and asked to observe the film in the light of different questions. The study focused particularly on how the subjects felt about one sister refusing to donate an organ to another sister diagnosed with cancer. Before starting the film, the researchers told the subjects that the sisters were either biological siblings or that the younger sister had been adopted to the family as a baby. The study discloses a major conflict between what the subjects told they felt about the moral issue presented to them and what actually happened inside their brains. 90 per cent of the subjects responded that genetic relationship between the sisters was of no significance to them compared to a situation in which one of the sisters had been adopted to the family as an infant. Still, functional magnetic resonance imaging reveals major differences in brain function between the two viewing conditions. ‘The impact on brain functions was amazingly high when we told about the difference in kinship between the sisters. The brain sees these two situations very differently,’ says Mareike Bacha-Trams, Postdoctoral Researcher from Aalto University. When the viewers thought that the sisters were genetically related there was significant correlation between their brain activity in the insula, cingulate cortex, medial and lateral prefrontal cortex, superior temporal cortex and superior parietal cortex. These areas of the brain control for instance such matters as morals, feelings, and decision-making. Based on the study, we can thus assume that the moral expectations of the subjects are more similar when the sisters are thought to be genetically related. Brain activity for the two tasks of a) deciding to rescue the own sister, a friend, or strangers from a dangerous country in red and b) watching a movie believing to see genetically related sisters in blue. NeuroscienceNews.com image is credited to the researchers. The same subjects were also asked to select which one person or several persons they would rather save from a crisis region. A sister, a best friend and unknown people were presented in various combinations, and more than 90 per cent of the subjects said that they would rather save their sister. The best friend came right after the sister. The response times got longer as the subjects had to choose whether they would, in addition to their sister or friend, save four unknown people. ‘The study is of significance in the field of social neuroscience when we want to know how people observe interactions between two people with a close relationship. This may also give rise for debate even in situations where scandals related to nepotism emerge in societal decision-making,’ Professor Iiro Jääskeläinen describes. In addition to Mareike Bacha-Trams and Iiro Jääskeläinen, the research team included Enrico Glerean, Juha Lahnakoski, Elisa Ryyppö, Mikko Sams and Robin Dunbar, Oxford University Professor known for Dunbar’s Number. Aalto University “How the Brain Reacts to Difficult Moral Issues.” NeuroscienceNews. NeuroscienceNews, 27 October 2017. Aalto University “How the Brain Reacts to Difficult Moral Issues.” http://neurosciencenews.com/moral-issues-neuroscience-7824/ (accessed October 27, 2017). Previous behavioural studies have shown that humans act more altruistically towards kin. Whether and how knowledge of genetic relatedness translates into differential neurocognitive evaluation of observed social interactions has remained an open question. 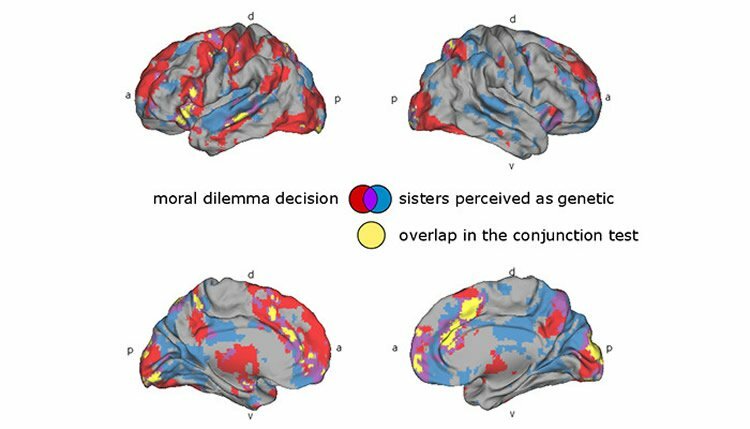 Here, we investigated how the human brain is engaged when viewing a moral dilemma between genetic vs. non-genetic sisters. During functional magnetic resonance imaging, a movie was shown, depicting refusal of organ donation between two sisters, with subjects guided to believe the sisters were related either genetically or by adoption. Although 90% of the subjects self-reported that genetic relationship was not relevant, their brain activity told a different story. Comparing correlations of brain activity across all subject pairs between the two viewing conditions, we found significantly stronger inter-subject correlations in insula, cingulate, medial and lateral prefrontal, superior temporal, and superior parietal cortices, when the subjects believed that the sisters were genetically related. Cognitive functions previously associated with these areas include moral and emotional conflict regulation, decision making, and mentalizing, suggesting more similar engagement of such functions when observing refusal of altruism from a genetic sister. Our results show that mere knowledge of a genetic relationship between interacting persons robustly modulates social cognition of the perceiver.